While the dream of millions of youngsters around the world is to one day be involved with the NBA, players that develop great basketball skills will sometimes have to make a choice. You may think that playing in the greatest basketball league in the world is an easy decision for basketball players but it isn’t as simple as you may think. You need to think about whether it is the right move for you at the right time. This is an even bigger decision if you are a European basketball player being offered the chance to head to the United States and pit your wits against the greatest basketball players in the world. This was a decision that Dario Saric had to make and he has stunned many observers by deciding to sign a new contract with Anadolu Efes from Turkey. Saric was a certainty in many people’s eyes to make the NBA so the fact that he has decided to stay in Europe for a bit longer has shocked many but of course, it may be a wise decision. 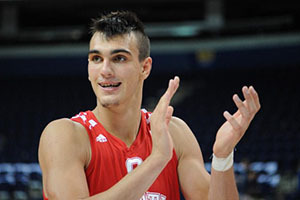 Saric is still only 20 years old and there will be plenty of time for him to move into the world of basketball in the near future. While he has signed a 3 year deal with his club, there is an NBA buyout option that comes alive after 2 years so he could be heading to the NBA in 2016 as a 22 year old. This may be a sensible option for the player, giving him the chance to develop more skills and greater confidence. There is a school of thought that you only get one chance at the big league and if you don’t take it when they ask, you don’t know if they’ll ask again. This is very true and it is something that Saric has no doubt thought about. Then again, life is full of so many uncertainties; you can never really know what is going to happen, even if you think about everything that could potentially have an impact on your life. An injury could threaten his career but Saric could quite easily pick up an injury in the US as opposed to Turkey, which means thinking along those lines provides you with no benefit. If you are playing the “What If?” game with your career, there are potential dangers in every decision you make. It is also important to remember that just because you are selected in the NBA Draft, you are not automatically going to play in the NBA and improve your career. Countless players every year are selected in the Draft only to be farmed back out to European leagues to gain more experience. Many of these players never get recalled or make that step up so being involved in the NBA Draft is not the be all and end all. Sometimes teams will snap p players in the fear of a rival team getting the player and getting lucky or just in the hope of finding potential that will grow into a real talent. The NBA Draft at times represents a gamble for the teams and they are often not too worried about cutting their losses on their gambles. In this regard, the decision of Dario Saric to stay in Europe for at least 2 more years makes perfect sense. Any 20 year old would find moving continent to be a bit daunting but to do so when the eyes of the world are watching you and with great expectations placed on your shoulders can be even more difficult. This is why taking the decision to step back from the NBA Draft is difficult but it is often the best decision. If you have been tipping Saric to rank well in the NBA Draft and need to change your pick, there is still time to do so. Betting on the NBA Draft is a way to add some more fun and spice to proceedings and keeps you entertained during the summer!